← Great Upanishat’S peaks: Who is the Director and Controller of Everything? This is a short post, unlike the earlier one. If you are our regular reader, you may be thinking with a sigh: Oh my God! What a great relief! 🙂 Just kidding! Here is another conVerse on the nature of oneness of Shiva and Shakti. 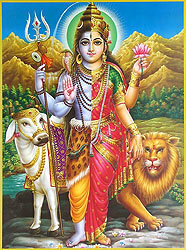 This is our humble offering with devotion, to the feet of the eternally united: Lord Shiva and Shridevi Parvati. A ConVerse is a conversation in a simple verse to deliver some important message directly to yourself. Relish, understand and have fun! OK. What are we waiting for? Let us get started! Shiva and Shakti, are like eyes – you see! Shiva and Shakti, are like ears – you hear! This entry was posted in conVerse, Oneness of Shiva and Shakti and tagged difference between shiva and shakti, oneness of shiva and shakti, shiva and shakti, shiva and shakti are one, shiva and shakti are one and the same, union of shiva and shakti. Bookmark the permalink.